I can’t remember how long I’ve been having meat-free Mondays, but it’s been a number of years. When I lived in England it wasn’t too hard to come up with suitable vegetarian meal options. The supermarkets always had a reasonable amount of vegetarian food in the freezer section. Some of the options had too much fat and not enough protein, but I usually found something in the end and I remember I was quite fond of Quorn burgers and sausages. The supermarkets in the Netherlands have some good vegetarian options as well. During my time there I ate quite a lot of lentil burgers and bean burgers, and there’s a company called HAK that produces some awesome meat-free food including chili, bolognese, and schotels. I always struggled to find vegetarian options in Spain though and often opted for a meat-free Spanish omelette. Here in Portugal, I haven’t found any good ready-made vegetarian meal options at all. Perhaps I’m not looking hard enough, or need to seek out a really big supermarket. That would make my Meat Free Mondays too hard though. I like an easy life, so today I decided to make an egg and lentil curry. I used to have a good egg and lentil curry recipe in my Deliah Smith cookbook, but that’s long gone. I threw it away after I decided to become a minimalist and got busy trying to simplify my life. 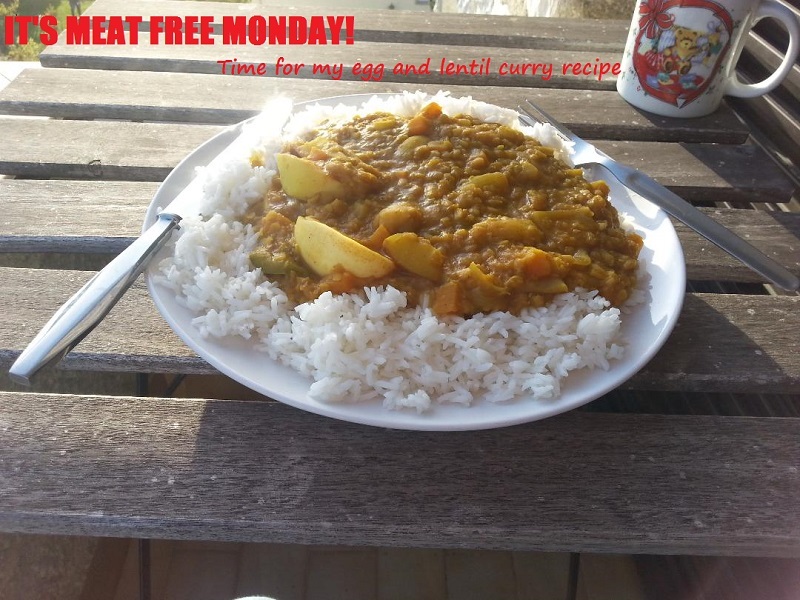 when I was in my early 20’s and moved into a bedsit in Darlington, I used to cook a lot of nice meals and I liked Deliah’s egg and lentil curry recipe because it gave me the opportunity to eat something different. As with many of her recipes, I modified it to my own taste and added a lot of extra ingredients. The problem is, although I took photos of some of the pages in the book before I threw it away, I forgot to take one of the modified egg and lentil curry recipe. I checked Deliah’s website and found some other lentil curry recipes, but not the one I used to use, so today I had to scratch my head and try to remember how I used to do it. I’m glad to say, the curry I made tasted pretty good. I began by roughly chopping a large onion and slicing up three cloves of garlic and threw them in a pan with a tiny bit of oil and fried them until the onion became a little softer and became transparent. The next thing I added was a tiny bit of salt and pepper, followed by one teaspoon of ginger, one teaspoon of turmeric, and two teaspoons of curry powder. I gave the mix a quick stir to coat the onion and then added one cup of lentils, four cups of water, and a heaped tablespoon of tomato purée. Then I threw in one finely-diced carrot and some finely-diced apple. I also added one small potato, cut into cubes. I don’t think Deliah’s Egg and lentil curry recipe had any of these things, but I’m pretty sure mine always did. I brought the mix to the boil and then turned down the heat and let it simmer for 20 minutes. Then I gave everything a good sir. The curry was still a little thin, but it was coming on nicely and I remember this was always the case, but stirring the curry helps to break-down the lentils and thicken things up. I also removed the lid to let the steam out and then diced half a green pepper and put it in as well. If I’d put it in too soon it would have boiled away. Fifteen minutes is long enough and that’s how long it takes me to do my rice. I kept stirring the lentil curry while the rice was cooking and added four hard boiled eggs (cut in two) for the last 10 minutes. Being careful to let them sit on the top of the curry rather than sink in. That wasn’t difficult because it was nice and thick now. I think it took my about 40 minutes to cook my revived egg and lentil curry recipe and that was including the preparation. I’d done too much. I got too very generous servings and popped the second plate in the fridge to eat for my supper. Next Article Next Article: I Had to Buy New Reading Glasses and It Cost Me More Than 99 Cents!